Read the full Sardinia Charter Guide and Italy Charter Guide. 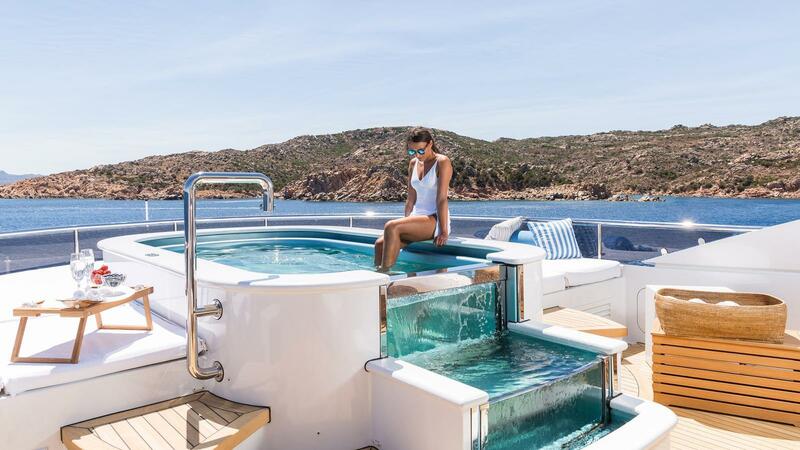 A 6-day private yacht charter itinerary visiting the stunning Portisco, Palau, Porto Vecchio, Bonifacio and La Maddalena. The first sailing will drive you from Portisco to the beautiful island of Caprera, to cast anchor in Cala Coticcio. The distance is 13 N.M., about 2 hours sailing between Soffi and Mortorio islands, and the well famous Cala di Volpe, natural shelter for small and big yachts. After the large rocks named Li Nibani you will be bearing for 320° straight to Cala Coticcio; this bay get two small beaches and the contrast between rocks colour and the deep blue of the sea water is very impressive. After your anchor weighing you will sail for 8 N.M., about one and a half hour, to reach the harbour of Palau. The second sailing day is the most exacting out of all week, so leaving early in the morning is a good advice. After the way out of the harbour on your left, there is the bay of Mezzo Schifo or “Nelson Bay”; here the famous English admiral used to cast anchor with all fleet and train the crews to sail in the narrow sounds between the islands. Sailing between Maddalena and Spargi you will reach the islands of Budelli, Razzoli and Santa Maria after 6 n.m., about one hour. In normal conditions, the best-sheltered anchorage is Cecca di Morto: we advice you to visit the pink beach and other small beaches with your tender. Porto Vecchio is 24 n.m. away, and buoys delimit its entrance: the path between them must be followed very strictly, particularly near the harbour entrance; of course, arriving in the day light is much better. The old town, surrounded by high town walls is at the top of a long gradient; very nice and typical to be visited for its restaurants and shops. The gulf of Rondinara is a beautiful natural shelter 14 n.m. south of Porto Vecchio, about two and a half hours sailing. Depending on weather conditions, you can spend the night there; with calm wind and swell, you can moor wherever you want; with East quadrant winds and swells, the best-sheltered mooring is in the northern part of the gulf, between the reef and the beach. From this position you cannot sea the open sea, it seems to be in a lake. The island of Lavezzi is 9 n.m. away from the gulf of Rondinara, you will sail about one and a half hour bearing south leaving on your right the island of Cavallò. The best bay here is Cala Lazarina in the South-West side of the island, read carefully the sea charts before approaching the spot. There are no inhabitants here but some cows and donkeys; they are no dangerous, even if bringing some kind of upset and confusion, especially among not well-informed tourists lying under the sun. On the back of the beach there is the cemetery where is buried the crew of the French frigate Semillante which sunk on these rocks on 1885. Lavezzi is one of the most beautiful islands of the whole area. Bonifacio is a huge natural fiord-harbour, sheltered with all weathers, and you will reach it after 6 n.m., about one hour sailing. Arriving from the sea the high white cliffs with the old town on top are the typical view of this sea village. As Porto Vecchio too, Bonifacio has its old town on top of the cliffs: from there you can have a superb sea view through Bonifacio sound on Sardinia. The sailing toward Isola Piana is short, 5 n.m., less than one hour. After Punta di Sperono you can cast your anchor in the South West side of the island, in clear waters, with sandy bottom about 4-5 metres deep. The sandbank between the island and Corsica, about 1 meter deep, does not allow boats to cross it, and its shallow and crystal waters are lovely. Our advice is to go on land by tender. After weighing your anchor, you will leave on your left Lavezzi, then sailing between Spargi and Budelli you will be again into the Arcipelago Della Maddalena. After 14 n.m., about 2 and half hours, you will reach Cala Gavetta, the harbour of La Maddalena. The island of Mortorio is famous for its wild landscapes, the huge sea-gull colony and the many taken shots in the years. You will reach it after 15 n.m., about two and a half hours. The best bay is on the South West side of the island. Less than one hour sailing away there is Portisco.